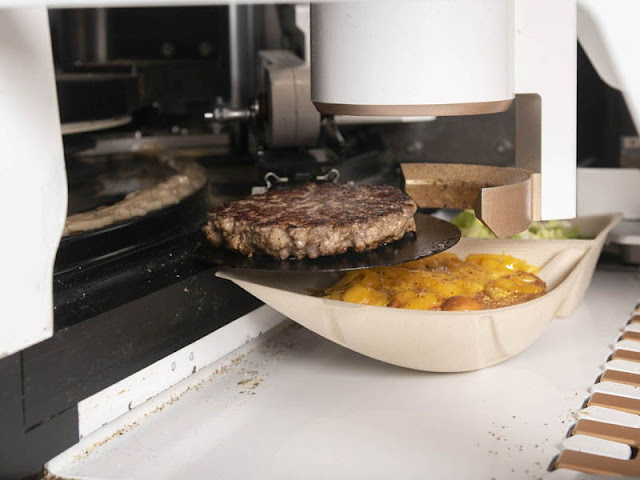 It does everything from slicing and toasting the brioche bun to adding toppings (to order) and seasoning and cooking the patties, all in five minutes. The meat is ground to order—why it’s touted as so fresh—and sourced from premium ingredients. It emerges from the machine piled with tomatoes and lettuce, sprinkled with seasonings, and drizzled with sauces, at which point it’s transferred by human hands to the customer. The price: $6.